November 15, 2015 39 Comments This post may contain affiliate links. Today is a day to arm you for the task of wrapping all those glorious holiday presents. I have teamed up with NINE other bloggers to show you creative ideas to present your presents this year. Be sure to visit all my friends in the links below! My mother in law is the best at wrapping pretty gifts. She takes her time, always has beautiful bows and is overall an amazing gift giver. My husband is a great gift giver. The apple doesn’t fall far. He is sneaky and always over delivers. My mom is the best at wrapping a gift with a gift. I, however, am not so great at any of these qualities, but I really do enjoy giving a gift. This is my attempt at combining all above mentioned qualities and making a good gift better by wrapping it with a gift. It’s really such a good way to start an opening situation, isn’t it? A few weeks ago I came across this family of deer for a quarter at a garage sale. Yes – that’s right 25¢ people! I knew they had a future in my world. My idea was, sadly, to break up the family and attach them as glorious gift tags to my Christmas gifts this year. 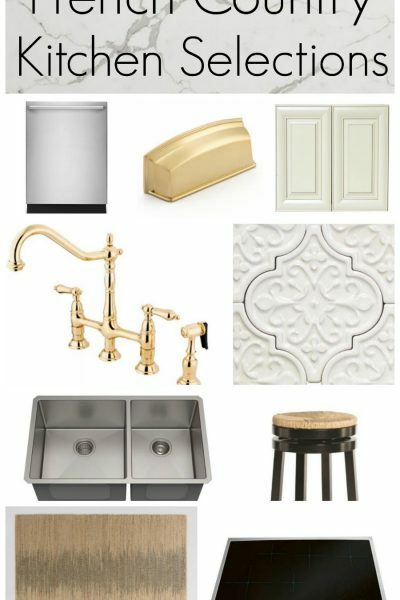 They started in a dreary brown state and a quick covering of cream colored spray paint set them straight. Then, I was off to give them a touch of personality. 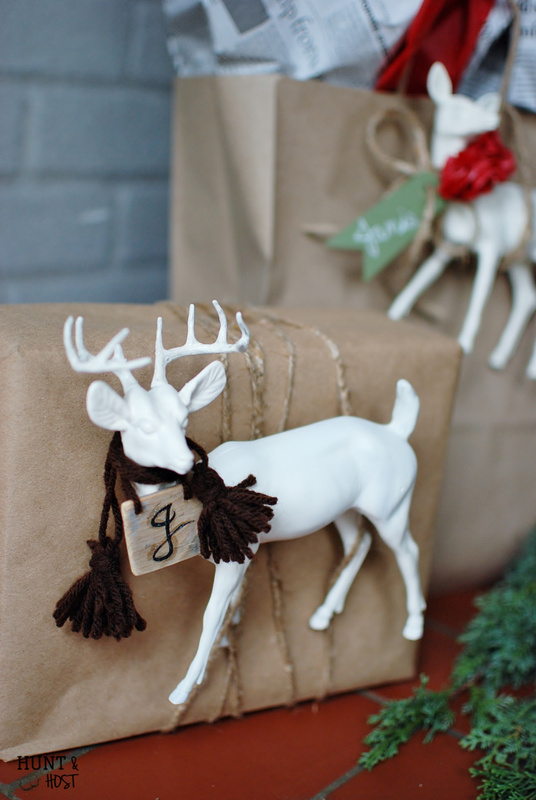 The buck got a handmade tasseled scarf complete with initial tag and the lady received a sparkly flower corsage. I know you are probably thinking this is a non-reproducible gift wrapping situation, but that is not true my friend! You just need to look at dollar store nativity sets, thrift store trinkets and garage sale doodads differently! 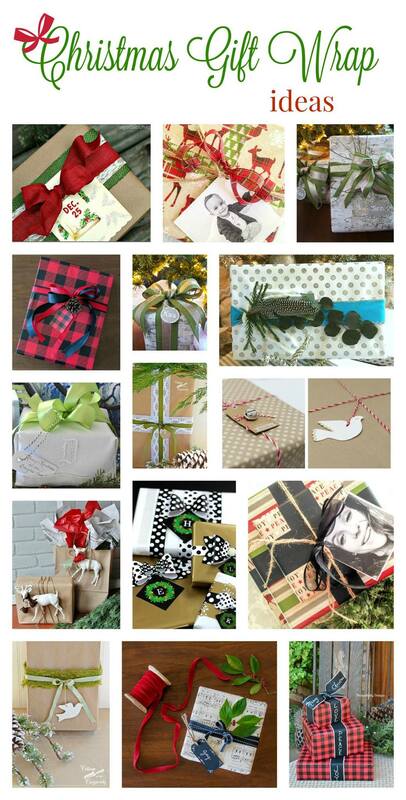 You can take any dime store score an remake it for a gift wrap homerun. 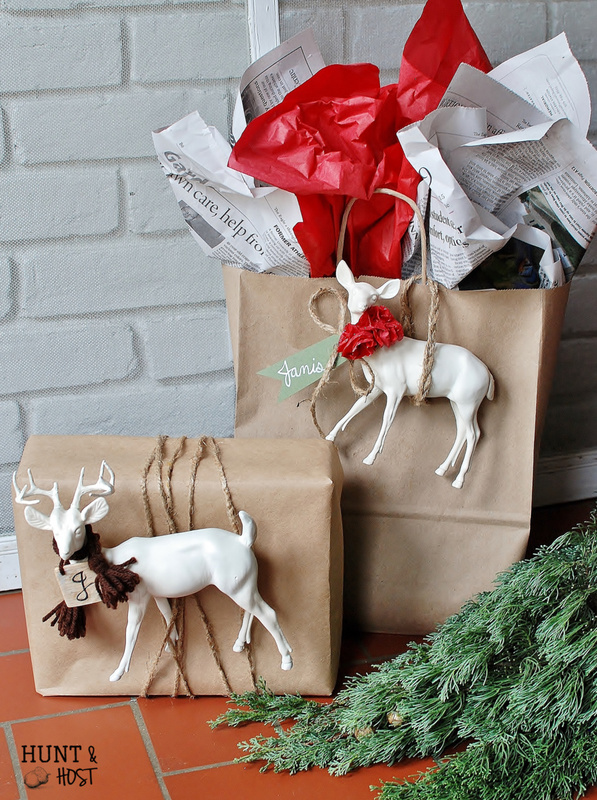 Break up baby Jesus and the wise men for a plethora of gift wrapping goodness! 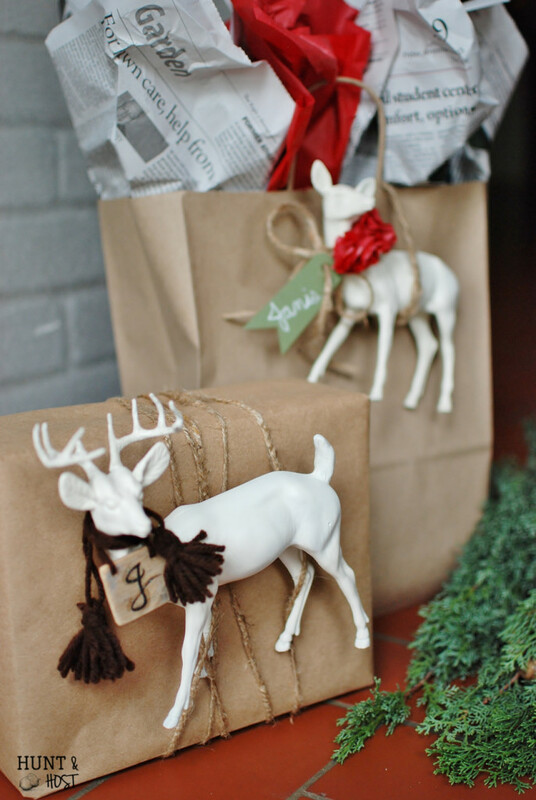 The best part about these sweet little deer is that once the Christmas package is torn into, your gift beneficiary will end up with TWO gifts. 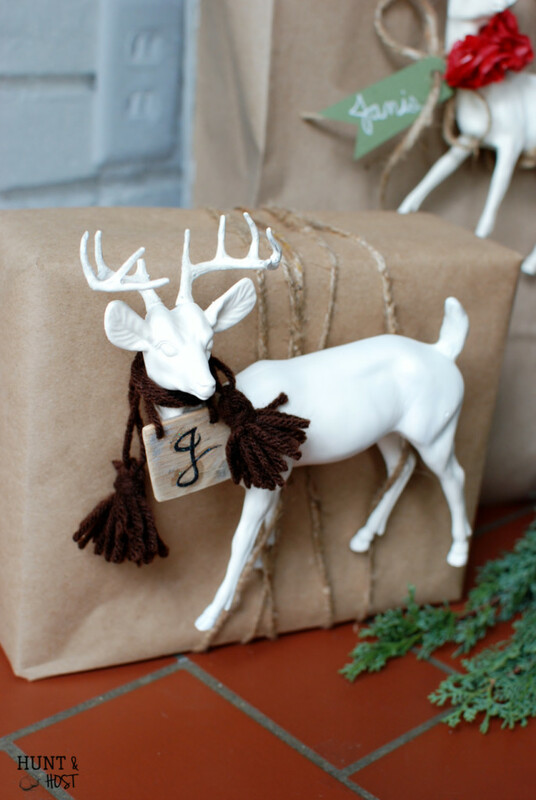 Can’t you just see these deer frolicking in a windowsill or tablescape next holiday season? It’s a gift that keeps on giving. 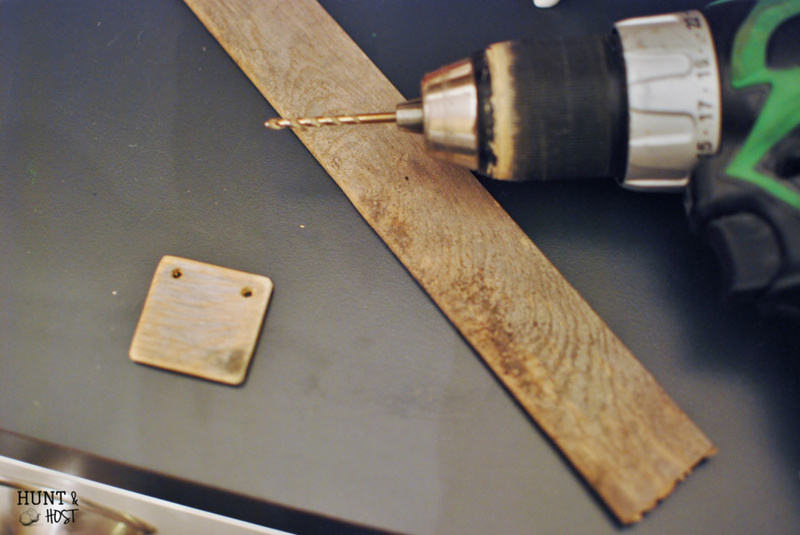 I made the homemade intial plate by cutting a small piece of wood, sanding it down and drilling two holes into it. 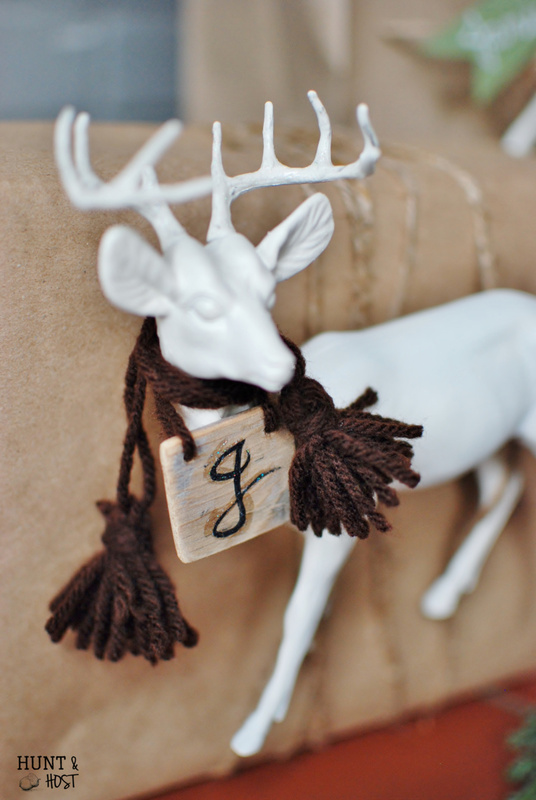 After freehand painting an initial and going over it lightly with Deco Art Glamour Dust paint I secured it to the deer with a fine brown yarn. 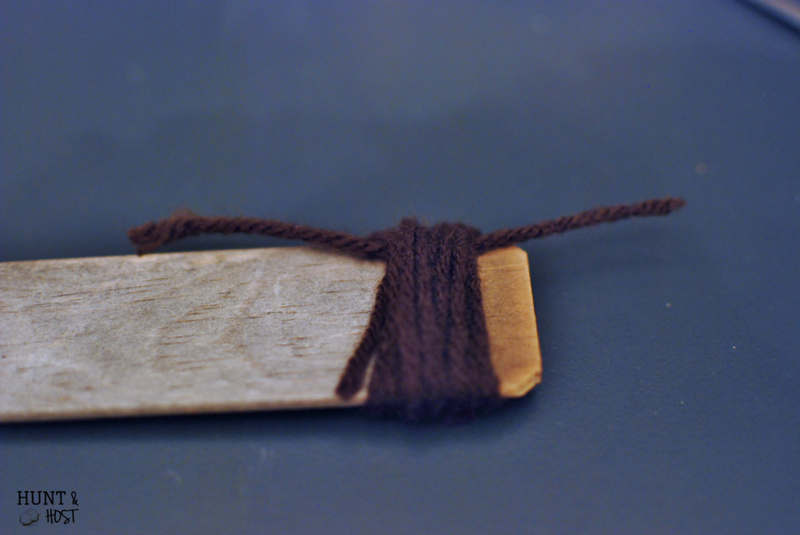 The tassels were handmade and wrapped around the neck with the same yarn. On the Doe I used tissue paper to add a floral necklace. The same concept explained here was used, but on a much smaller scale. I painted the edges of the flowers with the same Glamour Dust for a touch of sparkle. I also highlighted the deer’s ears, tails and noses with the shimmery touch of the glitter dust. You could do the same to gnomes, elves, nativity pieces or any figurine you come across. 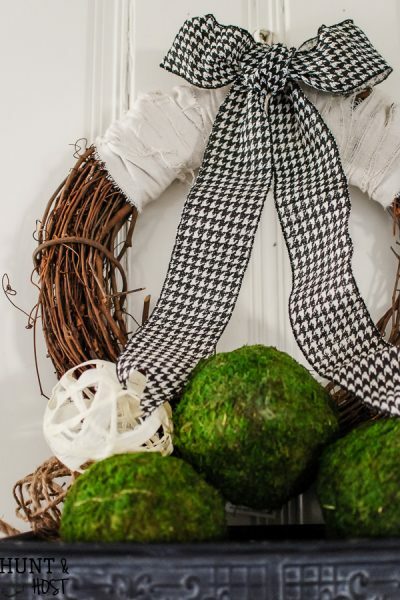 I hope this post inspires you to look at ways to wrap your gift with a gift this season. If you want to join along as we study the real gift of the Christmas season, check out our Advent study here. Merry Christmas friends, and please check out the other ideas below! Kim…25 cents? What a great find. Your deer transformation is adorable! And yes, we love the idea of a gift with a gift. So cute and thoughtful. Thanks for sharing! It was a rainy day and the lady was just trying to get ride of stuff. That always works out well for a shopper! Ah, those little deer are so cute. What a great idea. Don’t you just love Kraft paper. So many ways to customize. Thanks for sharing! I am a fan of the Kraft paper. The other talented ladies in the bunch are too, which makes it fun to see all the different ideas you can put into action! Thanks for hosting my friend! This is such a cute idea, and for $0.25 too! Thanks for sharing! There are great deals waiting everywhere for a transformation/gift! 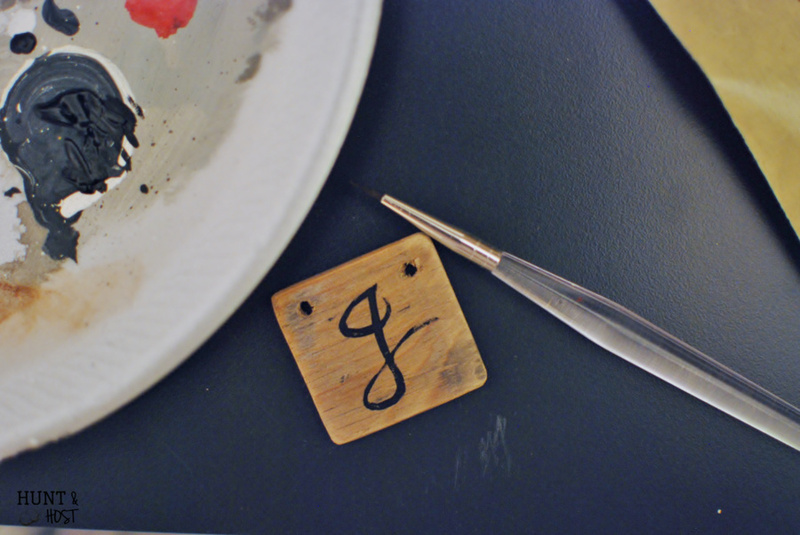 So LOVE this!…what a great find and the package is so very special for the recipient. Your wrapping a gift with a gift has to be my very favorite thing to do….and to receive! 🙂 Beautiful package…great partying with you…. Thanks Shirley, it is fun to give a gift that catches the eye. Such a cute idea and 25 cents was a great deal! It was a steal and so much fun to make over! Kim, I think your deer are just darling especially with the way you have personalized them! I predict your recipients are going to love them! And I wish someone would apply some Glamour Dust to me! It sounds so…uplifting!!! Very very cute and clever and thrifty! This is such a fun idea, Kim! I often think that the gift wrap is as much or more fun than the gift. It’s the thought behind it all that makes it so sweet. agreed, nothing better than feeling good about giving a good gift. So happy you like it Andrea. It’s a fun way to give and receive a gift for sure! I love wrapping gifts and I often add an ornament to the bow on front. 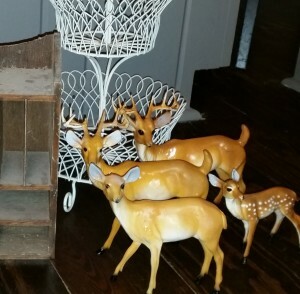 I love these deer and have been looking for “castoffs” at flea markets, Goodwill, etc. You have “re-inspired” me! These packages look great! the recipients of the deer can leave them out at least through the winter season. I love the “glitter dust” with which you have embellished them! 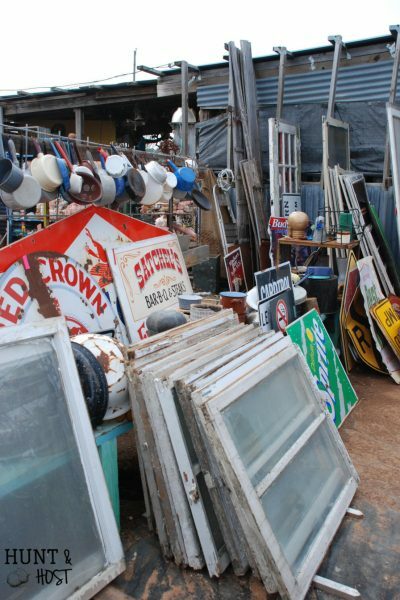 Now that you are on the lookout you will find all sorts of goodies. It’s best to look all year long and stock pile them for next year! Happy hunting! What cute ideas, Kim! Love these! thank you for sharing Melanie! Blessings back at ya! Completely fantastic! I am pinning this wonderfully creative idea.Can’t wait to see what you do for the Texas blog hop. Hope you are enjoying a cozy Monday. Love your idea! And I am so jealous of your deer purchase! What a great find! It was a nice score, I can’t lie!!! Thank you Debbie! 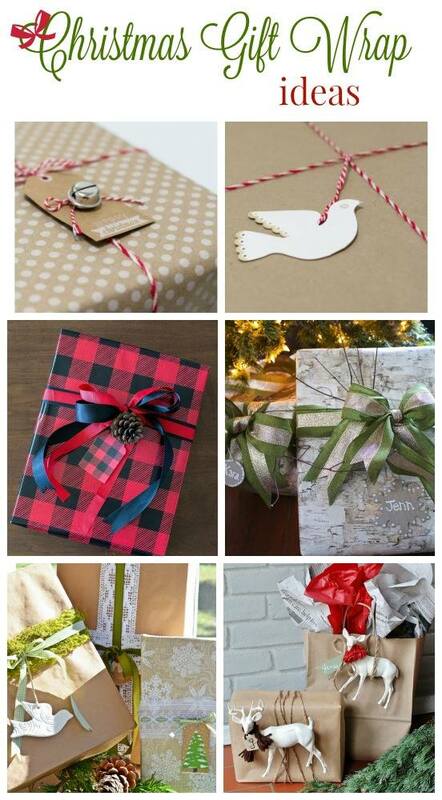 Just found your blog today (via the Stone Gable blog) and love your Christmas gift wrap ideas! 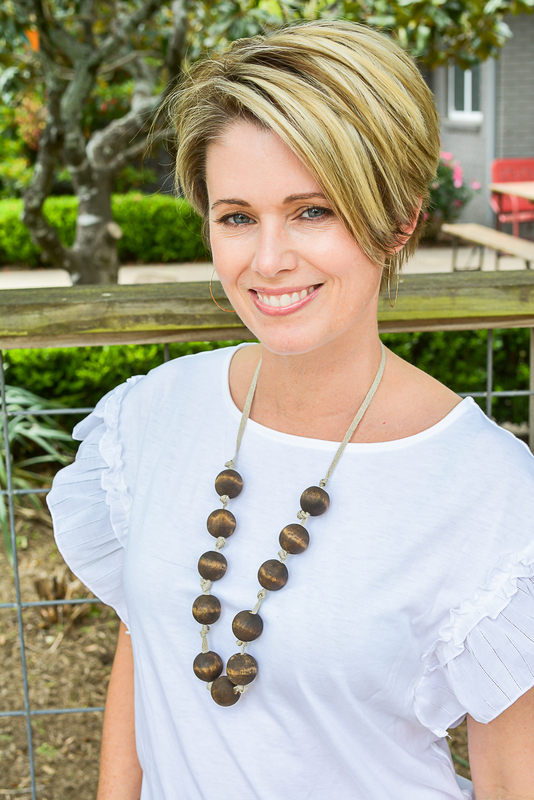 I not only signed up for your blog and enjoyed several different recent posts, but I started following on Pinterest and then I saw why I like your ideas so much…..we are both “Texas girls”! I grew up in Lufkin. Looking forward to following along and seeing more Christmas ideas. Love a Texas girl!!! So glad to have you here, I hope you enjoy the thoughts and projects. I look forward to hearing from you! What a great idea for those reindeer. I love your idea. Your packages look beautiful. Thank you! They are fun little add ons! This is an awesome idea. I will have to try that. Thanks Betty – You and your gift receiver will enjoy it! What a fabulous idea! 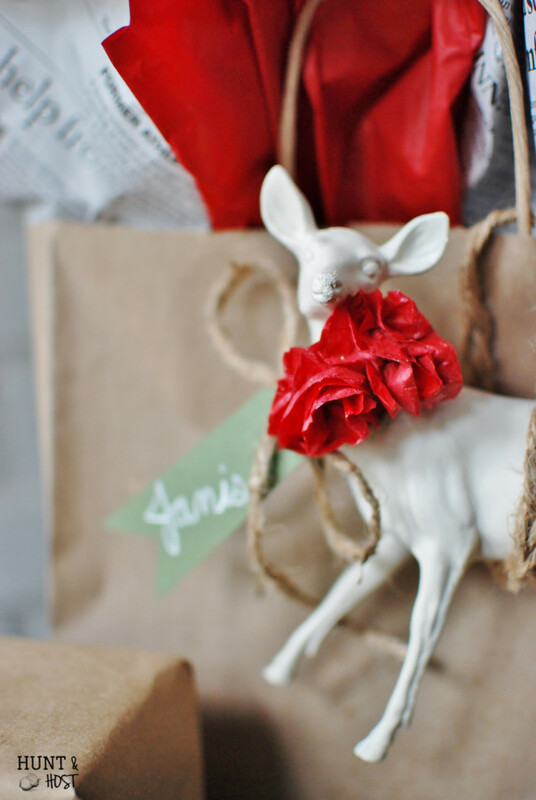 You really transformed those adorable deer and made them look elegant as “gift tags”. 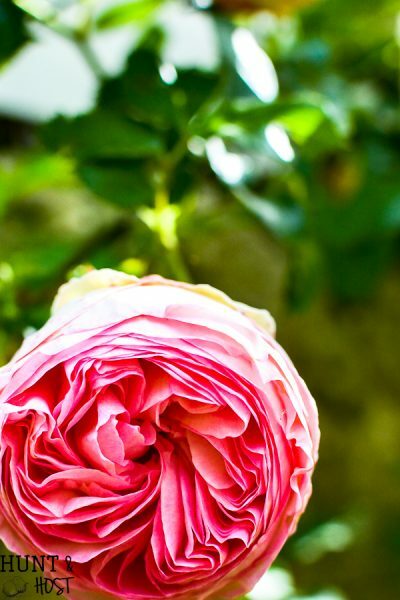 Well I would love to receive such a pretty gift! Featured you at Be Inspired this morning. Thanks so much for sharing! I appreciate the feature so much! That is so kind thanks a bunch Sharon! I like this idea a lot. Yesterday I found 3 different, miniature dinosaurs from a long-ago birthday cake. I wondered what I could do with them. Your deer are much more seasonal, but if I need to give a child a gift — well, you’ve given me an excellent idea. I saw your link at the Vintage Inspiration Party. They would be precious painted in bright colors! 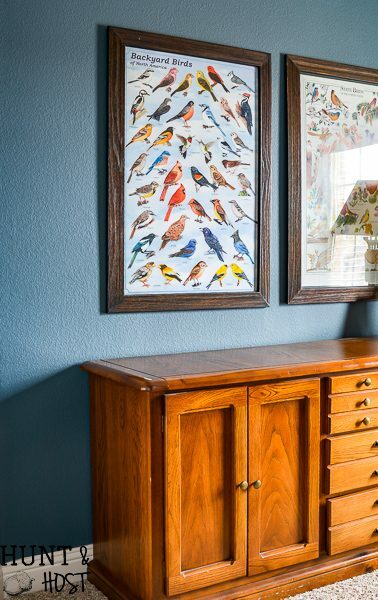 You could do this idea to all kinds of thrift store items!